This communication was sent to Direct FannieMae Vendors (REO Appraisal Vendors) and covers a number of important instructions required for properly submitting REO appraisals. Please read it carefully and retain it for your reference. The new UAD format does not provide fields for Days On Market and Cumulative Days On Market (DOM/CDOM) nor the name of the Subdivision, which we request for comparables. On the next line, write "Subdivision Name" and enter the name of the subdivision, if applicable. Effective Age (Yrs) and Actual Age UAD instructs that if the age of the property is not known, then you are to estimate the age and use the tilde character (~), typically located left of the number 1 key, to show the date is approximate. This may cause a "Draft Not Acceptable" error within AppraisalPort. Please alert us via AppraisalPort if this error occurs, and we will accept the case. For both Effective Age (Yrs) and Actual Age, enter a whole number (no decimal places) representing number of years. Only include remodeling and renovation costs when there is extensive damage that will require many repairs where making these improvements in the process makes sense. Otherwise, Do NOT include these costs in your repair estimates which should include repairs needed to bring the property up to a typical condition for the neighborhood. Any external influences and any positive or negative impact on value should be addressed in the appraisal. Include enough pictures to support the subject property condition rating with a special focus on bathrooms, kitchen and other improvements. We will soon be implementing a new Order Letter. The new letter is more streamlined, and intended to provide you with the key points and tips to complete your assignment according to Fannie Mae process and format. The affected topics (and specific paragraphs) are noted for each policy change. Lenders should review each topic to gain a full understanding of the policy changes. The updated topics are dated October 25, 2011. On July 26, 2011, Fannie Mae issued Announcement SEL-2011-06, Selling Guide Updates, which contained information concerning the Uniform Appraisal Dataset (UAD) and the Uniform Collateral Data Portal (UCDP®). The UCDP is the joint portal through which lenders will be required to submit electronic appraisal reports to Fannie Mae and Freddie Mac. The UCDP was made available on June 27, 2011, for customers and their designated agents to begin to submit selected appraisal data files. Lenders must ensure all applicable appraisals have been completed in compliance with Appendix D of the Fannie Mae and Freddie Mac Uniform Appraisal Dataset Specification (“UAD Specification”). (Previously, the Selling Guide referred to the entire UAD Specification.) Appendix D lists the requirements for the data that must be included in specific forms and how the data must be communicated on the appraisal report. In addition to submitting the required Fannie Mae appraisal reports forms to the UCDP, lenders must also receive a “Successful” status from UCDP before the delivery date of the mortgage loan to Fannie Mae. The four UAD appraisal report forms with effective dates on or after September 1, 2011, must be completed utilizing Appendix D of the UAD Specification when reporting the results of an appraisal for a conventional mortgage loan. For all conventional mortgage loans for which an appraisal report form is required and with an application date on or after December 1, 2011, and a delivery date on or after March 19, 2012, selected appraisal report forms, including all exhibits, addenda, and photographs, must be submitted to the UCDP and receive a “Successful” status from UCDP before the delivery date of the mortgage loan to Fannie Mae. A2-5.1-03, Electronic Records, Signature, and Transactions (Uniform Collateral Data Portal™(UCDP™)): Information concerning the UCDP has been added to this topic. B4-1.4-12, Appraisal Report Review: Actual and Effective Ages of the Improvements: This topic has been changed to clarify that whenever adjustments are made to an appraisal for the year the dwelling was built, the appraiser must provide an explanation for the adjustments. B4-1.4-18, Appraisal Report Review: Lender Review of the Adjustment Grid (Proximity to Subject Property and Location, Date of Sale and Time Adjustments): The description of the proximity of the comparable sales to the subject property must now be reflected in “miles” and include the applicable directional indicator. This topic also requires the lender to provide the month and year of the sales contract and settlement or closing for comparable sales. 1. Purpose. The purpose of this circular is to announce the adoption of Uniform Appraisal Dataset (UAD) compliant appraisal reports for Department of Veterans Affairs (VA) Loan Guaranty Program purposes. 2. Effective Date. * Effective immediately, VA fee appraisers may, as an option, use UAD compliant versions of the forms. Effective January 1, 2012, VA appraisal reports utilizing Fannie Mae Forms 1004, 1073, 1075 or 2055 must be UAD-compliant. b. Appraisal software vendors have incorporated the UAD requirements into their form software that is currently available on an industry-wide basis. Although only appraisal reports for conventional mortgage loans sold to Fannie Mae or Freddie Mac are required to be completed in compliance with the UAD at this time, it appears that UAD will become an industry standard, since UAD has been adopted by FHA. c. To prepare for the adoption of UAD by VA, Fee Appraisers should become familiar with the modified appraisal forms, including the UAD field specific requirements detailed in Appendix D of the Uniform Mortgage Data Program, and which is posted on the web sites of Fannie Mae and Freddie Mac at https://www.efanniemae.com/sf/lqi/umdp/uad/index.jsp. 4. Details. VA is moving to require UAD-compliant appraisal reports to remain in step with changes in appraisal reporting, to support consistency in appraisal reports, and to ensure the acceptability of VA appraisal reports within the industry. Most aspects of this change to UAD require only clarification of existing policy or procedure; however, there are three actual changes to standing policy or procedures that must be noted. Reference Section 6 of this Circular for those changes to policy and procedure. a. VA Fee Appraisers will continue to complete VA appraisal reports in accordance with the requirements of the VA Lender’s Handbook (VA Pamphlet 26-7, Revised) and instruction and guidelines from VA. Fee Appraisers are reminded that completion of the data fields of the appraisal report does not relieve them of the duty to provide adequate explanations in the addendum to provide clarity and justification. b. Appraisal reports will continue to be quality-reviewed for compliance with VA requirements. c. While the UAD may allow for the use of unsettled sales in the sales comparison grid, VA requires that only settled sales be used. d. UAD requires appraisers to provide specific information regarding remodeling in the past 15 years; VA expects Fee Appraisers to recognize and describe remodeling or updating and to make appropriate adjustments. On VA appraisals, Fee Appraisers should also report UAD information concerning the remodeling if it is available in the “normal course of business” within VA timeliness requirements for completion of the appraisal. a. The requirement that only the “Department of Veterans Affairs” be entered in the Lender/Client field of the appraisal form is rescinded. Instead, the lender’s name will be entered in this field, as well as the “Department of Veterans Affairs” as the Client of this field. b. The requirement that “Intended User: Any VA Approved Lender” be entered in the Address field for the lender is rescinded. Instead, the address of the lender will now be entered in this field. Will the new UAD appraisal standards result in lower mortgage rates? According to Peter G. Miller's 9/6/2011 HSH Blog article, "New appraisal standards to impact mortgage rates", the answer is YES! Mr. Miller says, "They may allow us to unearth faked, falsified and incompetent appraisals and thus prevent loan fraud, illegal flipping and bad mortgage investing. And such improvements in the valuation process might actually lead to lower mortgage rates by removing excess risk from the marketplace." He feels that illegal flipping and "faked appraisals" were key factors in the mortage meltdown and that, "Tighter appraisal standards [will] make it easier to catch cheats and, also, to drive bad appraisers and lenders out of business." He concludes that "the new appraisal standards will allow lenders and government officials to quickly review past appraisals to see if they conform to national standards. If yes, fine. If not, lenders are likely to provide less business (or no business) to the appraiser with the bad rep."
Fewer cheats ------> Reduced lender risk -----> Lower mortage rates? Do you think that appraisers and flipping were the cause of the mess that we're in? Will the UAD actually prevent bad mortgage investing? Will improvements in the valuation process really lower mortgage rate? PR: TROY, MI--(Marketwire - Sep 7, 2011) - Residential appraisers seeking to fulfill requirements of the new Uniform Appraisal Dataset (UAD) will find the new UAD checklist available from DartAppraisal.com to be a helpful tool in compliance. The UAD checklist, also available at www.dartappraisal.com/media/appraiser_checklist.pdf, contains a quick reference of information required for UAD-complaint appraisals, including 38 specific line instructions and nearly 50 common abbreviations. Checklist categories include Timeframes, Location Factors, View Factors, Sale Type, Financing Type and more. DartAppraisal.com recently announced its full coordination of efforts in compliance of the UAD to properly manage appraisals (1004 URAR, 1073 Condo, 2055, and 1075 reports with an effective date of 9/1/11 or later). Comprehensive infrastructure updates were required, and specific enhancements made to DartAppraisal.com's exclusive technology and data structure guarantee that appraisal reports adhere to UAD regulations. DartAppraisal.com is a leading independent provider of nationwide residential real estate valuations. The Troy, Michigan-based company provides appraisal management services, automated valuation models (AVM's), and other custom valuation solutions for hundreds of clients. www.DartAppraisal.com. Appraisers began submitting electronic property data for mortgages sold to Fannie Mae and Freddie Mac under new guidelines that took effect Thursday (9/1/11). As a result, the government-sponsored enterprises will be building a massive database of every appraisal backing every mortgage sold to them. But the firms, which — combined with the Federal Housing Administration — guarantee or insure 95% of the entire mortgage market, have been silent on what they plan to do with the data. This Uniform Appraisal Dataset defines the new ways appraisals will be submitted. The GSEs are also developing a Uniform Collateral Data Portal, where the appraisers can make the submission. The UCDP went into voluntary effect June 27 and the use of it will be a requirement starting March 19, 2012. Rich Andreano, a partner at the financial law firm Patton Boggs told HousingWire those in the industry are wary of this new vault of appraisal information. "Once you standardize it and automate it, it makes it easier to study a group of loans. Someone can conduct the analysis and say, 'Hey, you know we took a look at all the data and we noticed a trend that is troubling," Andreano said. "They can look at where appraisals are coming, if they're coming from certain areas, which appraisers are getting work, and they can raise questions that suggest further due diligence is needed." Lenders know that with access to this kind of data, the GSEs will have an easier time enforcing repurchase and warranty claims. The lender can be made aware of a possible appraisal problem before the loan is even closed. If the lender goes ahead and sells the mortgage to Fannie or Freddie anyway, the risk of having to repurchase that mortgage if it slips into nonperforming status skyrockets. Have you waited until the last minute to get up to speed on the Uniform Appraisal Dataset requirements that go into effect today (9/1/2011)? This video will help you get from 0-60 in about 42 minutes! This video walks you through ALL of the UAD-impacted fields of the URAR. All of the appraisal software developers have done there best to implement the new UAD requirments, but there are still confusing parts of the GSE rules. In fact, according to Joel Baker of a la mode, inc. "Most of the questions we get have little, if anything, to do with the software." This video helps bring clarity to those confusing parts. 1. Below is a complete copy of an email from Bob Murphy at Fannie Mae. It is provided as an urgent matter. We are reaching out to you to help us reinforce the GSE's September 1, effective date for Uniform Appraisal Dataset (UAD) forms. Yesterday, several news outlets published articles incorrectly reporting that the UAD effective date was pushed back to January 2012. The GSEs (Freddie Mac and Fannie Mae) have NOT changed their UAD effective date of September 1, 2011. The January 1, 2012, effective date is the adoption date for FHA, which recently announced it will adopt the UAD and two of the UAD compliant appraisal reporting forms. More information on FHA's adoption of the UAD is available in their Mortgagee Letter 2011-30. The GSEs have not changed their UAD effective date. September 1, 2011 remains the effective date for appraisal reports to be completed in compliance with the UAD for conventional mortgages sold to the GSEs. The January 2012 date is the effective date for the use of the UAD for FHA. More information on FHA's adoption of the UAD is available in their Mortgagee Letter 2011-30. Additionally, we are posting reminders on our Websites about the September 1 effective date - and wanted to ask you to help us and do the same (if you have not already). A suggestion is below. "Reminder: September Uniform Appraisal Dataset Effective Date is Approaching - Fannie Mae and Freddie Mac are requiring UAD forms for all appraisal report forms with effective dates of September 1, 2011 or later." Thank you again for your support in helping to prepare the industry for these changes. 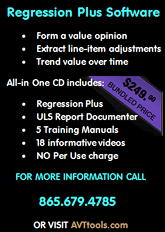 Dave Towne posted a message to the Appraisers Forum site a few months back with his UAD Quick Reference Guide. His reference guide condenses the current 37 page UAD Appendix D manual into 5 basic ½ sheet pages, plus a conversion chart for the site size (since many counties report small sizes as a digital portion of an acre). Dave said in his recent email update: "This has been featured in the Appraisal Scoop & Appraisal Scoop Facebook page, in a post on the AppraisersForum, and I’ve sent it to other appraisers. I don’t expect anything for it, but if you find it useful, send a check to your local food bank for what you feel it is worth. This prints to 3 pages. Those are designed to be cut in half to make a small booklet you can keep at your desk and in your vehicle. For easier reading and ‘eye memory’, print each page to a different color paper. I had each 2 pages laminated ‘upside down’ back to back, and had the print shop put a spiral binding at the top to make a flip booklet. I greatly abbreviated the Q & C definitions, but those have enough detail to help appraisers determine which number to use for Quality and Condition. Remodeling/renovated descriptions are included. For appraisers in suburban areas where site sizes for subject and comps straddle the magic 1 acre size, there is a conversion table from digital acre size to square foot size. Happy appraizin’ using the UAD!" Purpose of this Mortgagee Letter: The Federal Housing Administration (FHA) will adopt the Uniform Appraisal Dataset (UAD) and two of the UAD compliant appraisal reporting forms, which further define specific data fields in these industry standard appraisal reporting forms. To allow Mortgagees sufficient time to make any necessary data system changes, the requirements of this Mortgagee Letter are mandatory for all case numbers assigned on or after January 1, 2012 and for all appraisals performed on HUD real estate owned (REO) and Pre-Foreclosure Sale (PFS) properties with an effective date on or after January 1, 2012. Prior to the effective date, Mortgagees, at their discretion, may accept and submit for loan endorsement an appraisal in either a UAD compliant format or a non-UAD compliant reporting format.